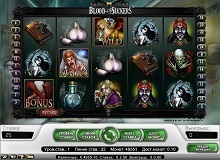 Blood Suckers is a rich and entertaining vampire-themed virtual slot from NetEnt’s rich gaming portfolio. As expected, the game encompasses an eerie setting with a variety of chilling vampire inspired symbols on the reels and a creepy soundtrack to complete the picture. The variance of this gaming machine is mostly low, but it has a high RTP factor of 98.00% to ensure that you get the best returns from your stake. The highlights of the slot include a lucrative free spins round, a bonus game, and wild substitutions. Read on to learn the game mechanics and how to trigger the jackpot reward of 7500 coins as you play Blood Suckers for real money in NetEnt casinos online. The grid of Blood suckers slot is made up of 5 reels, 3 rows, and a total of 25 paylines. As we’ve already mentioned, all the characters on the paytable have an aspect of the vampire theme. They are 11 in total; 3 special icons and 8 regular characters. The standard symbols include a Test Tube, A Bible with a silver cross on top of it, a Bow and Arrow, Garlic, and four nerve-jangling Vampires. 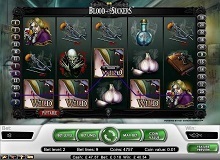 A Scatter element represented by a blood-sucking bride and this is your key to the Blood Suckers free spins round. Blood Suckers game features fairly basic rules and straightforward mechanics which make it suitable for players of levels. The machine offers 4 betting levels and you can play with a range of coin sizes depending on how much you intend to stake per spin. You can adjust your bet by following these easy steps. Activate as many playlines as you wish. Select the value of coin you want to wager on each betway. The options range between €0.01 and €0.20. Choose a bet level between 1 and 4. You bet level is simply the number of coins you will stake per line. You can wager one coin, two, three, or four depending on your budget. Confirm your total bet. You can stake as little as €0.25 for 25 betways at €0.01 if you opt for the basic level. The maximum bet is €50.00 for all play lines with a line wager of €0.50 at the highest bet level. Hit the Spin button to get the reels moving. For those who don’t like manual spins, you can use the autoplay feature to pre-set any number of automatic rotations between 10 and 1,000. After doing this, you can sit back and relax as you wait for the symbols to align on the grid. The winnings are the best part of playing Blood Suckers casino slot online, and they are quite easy to come by given the high RTP of the slot. All you need to win in the game is to land a set of three matching symbols on successive reels, in a left to right arrangement. The Wildcard in the game can also help you form winning combinations by substituting other standard symbols on the reels. Your prize for each round is calculated by multiplying your line wager by the symbol multiplier and in case you land more than one combination in a spin, the machine sums up all your winnings for that round. When it comes to the payouts, the Wild is the most valuable symbol with a payout of 7500 coins for the highest combination. It is followed by the Vampire with the Red Turbine which awards up to 500x your line bet for 5-of-a-kind. 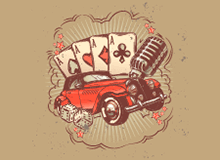 Besides the payouts from the regular icons, you can also boost your bankroll by getting 2 to 5 scatter symbols on the reels in any random positions. The scatter pays at the rate of 2X, 4X, 25X, or 100X your total wager if you land 2, 3, 4, or five icons respectively. In addition to the cash prize, you also get 10 free spins for landing 3 to 5 scatters, and it is possible to retrigger this feature during the round. 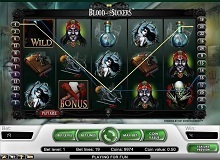 The bonus game is yet another opportunity to earn a decent amount of money at no extra cost as you play Blood Suckers slot machine online. A player unlocks this feature if they land 3 to 5 bonus icons on an active payline and you can only get one bonus game per spin. This round plays in a separate screen which resembles a stone burial chamber with a series of coffins. Your task is to open the coffins to find blood suckers and slay them. You’re awarded a bonus for each slain vampire, and the feature terminates when you click on an empty coffin. Blood Suckers in an enthralling slot that would easily appeal to any player who enjoys watching gothic inspired shows or movies. The theme is well executed with high-quality graphics and spooky sounds to create a blood-chilling atmosphere. When it comes to the rewards, you will love the regular wins during the base game and although they may not be that huge, you have lucrative free spins round to make up for it. There is so much more to this casino slot, but you can only experience its thrill firsthand if you give it a try.